Great mag as always! I just read your Ten Turbo Toying Tips and have a question about something that was said. In the very first section of the article in the intercoolers section you say "Intercoolers should also be painted matt black for maximum heat dissipation." How does colour have anything to do with heat dissipation? On top of that, wouldn't a coat of paint over the bare (or anodized) aluminium hinder heat dissipation by forming a thin layer of insulation? Thanks. In the same way that matt black better absorbs heat, matt black better radiates heat. However, this effect is most pronounced with radiation that is short wave (eg visible light) rather than long wave (eg radiated heat from a hot intercooler). However, when we back to back tested an intercooler (one that had previously been painted black and then stripped of paint), we saw a slight increase in intake air temps. We think the insulating effects of a light coat of black paint are trivial. Re: Breathing Deeply. 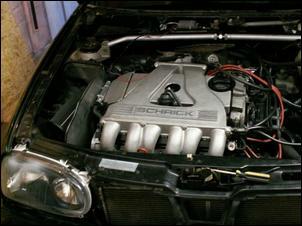 I was just going to share with you some info about the VW VR6 motor. The 12v VR6 has three different styles of intake manifolds, all of which have different plenum sizes and hp/tq numbers. An aftermarket company called Schrick makes a "variable geometry" manifold, that splits the left and right cylinders....and at low rpm the left cylinders draw from the left side of the manifold, the right draws from the right, then at 4000 rpm a butterfly opens and both cylinders draw from both sides. The results are roughly 20ft lbs of torque at 4000 rpm and roughly 5-10hp near 6750 rpm. It should also be noted that with the revised 24v VR6 motor that VW has gone back and made their own two stage manifold! I read with interest your Holden Captiva MaXX. Having not driven it myself, I can't confirm or reject the findings of your evaluation. I have driven the Holden Captiva LX and it is nothing like the car that you described. Although your article referred only to the MaXX variant, I think it unfairly omitted to explain to readers that this was not typical of the entire Captiva range. While the SX, CX and LX are manufactured alongside the MaXX at the GMDAT plant at Bupyong, they are two very different vehicles. The Holden Captiva was heavily developed by GM Holden from its inception but had no input into the MaXX which is in fact not a Captiva but an Opel Antara. I just hope that readers who are more likely to buy the 7 seat CX and LX don’t get the wrong impression. On Michael Knowling's piece on aerodynamics (see Aero Basics), there is a minor error in the article. The "Fan Car" from the ground effects era, the fan was not universally used, it was only used by Brabham (BT46B), which used an Alfa Romeo engine. The reason was that Brabham (and Ferrari) used a Flat 12 engine, which made undercar venturis pretty much impossible. As such, they lost a significant amount of downforce compared with cars that did have the venturis. The fan was Gordon Murray's attempt to get around the problem (he used the argument that the fan was not a movable aerodynamic device, but that more than 50% of the effect was for engine cooling). The car only participated in one race, if memory serves, and won that race. Loved the new car test Holden Captiva MaXX, don't think Holden will though... It's refreshing to see that some parts of the media are willing to say it like it is instead of re-hashing the manufacturers' propaganda during supposedly independent tests. If it's good then it's good, if it ain’t then it ain’t - can't be any simpler really? My 2c on other comments regarding content and credits for articles: I have been a follower of Julian (& Co) from Zoom through to AutoSpeed and I have found that things are credited as to their origin and editorial view except where a mistake is made. From my experience in those situations, mistakes always seem to be corrected and a statement is made detailing this. There is no secret made of the fact that views stated are the opinion of Julian (& Co) whether they are favourable or not. I feel that AutoSpeed goes out of their way to state this in all their articles; witness the negative feedback regularly posted on your site. If it were just a chest beating site, would these comments be there? I feel that the majority of subscribers are more than happy with the site, going by the quality improvements that have been happening over the years. You guys will always have my subscription. I have been a regular reader for the last 5 years and will no longer continue to subscribe to this website due to the repeating of articles I have read. There is no longer daily enjoyment to see what article is there as most are re-hashed.